JAKARTA, Indonesia (CNN) -- Indonesian President Susilo Bambang Yudhoyono held a commanding lead in national elections Wednesday, according to the latest exit polls. A woman votes at a polling station in Indonesia. An average of six exit polls showed the incumbent holding about 60 percent of the vote compared to 27 percent for former President Megawati Sukarnoputri and 12 percent for Yudhoyono's vice president, Yusuf Kalla. Official results are expected no sooner than next week. 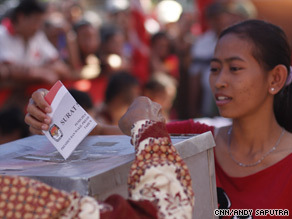 Indonesia has 175 million registered voters spread over 17,000 islands. It was the country's second direct election since the authoritarian regime of dictator Suharto fell in 1998, in the wake of the Asian financial crisis. Yudhoyono "has positive global image; relations with the American government have been the best in all the time that I have been here, the last 30 years," said James Castle, who analyzes Indonesia's politics and economy. "He's very popular in the foreign community and, to be honest, if he's not re-elected, the markets will react negatively for a month or so." Yudhoyono's Democratic Party was the only single party to get enough votes in April's legislative elections to nominate a candidate on its own. Kalla's Golkar Party came in second and Megawati's Indonesian Democratic Party of Struggle, or PDI-P, placed third. Kalla and Megawati had to form coalitions with other parties to run for president. Kalla had hoped voters would give him some of the credit for Indonesia's economic successes which occurred under his term as vice president. Yudhoyono is known as "Mr. Clean" because of his anti-corruption efforts. He has gained popularity for his handling of the 2004 tsunami recovery and the country's battle against terrorism. Indonesia has had impressive economic growth over the past five years, though how much direct credit Yudhoyono can take for that is questionable. And despite Indonesia posting an average of 5.9 percent annual growth during his presidency, little of that has trickled down to the country's poor. Yudhoyono's opponents say he is too liberal, is too skewed toward the west, and doesn't pay enough attention to the 40 million Indonesians living below the poverty line. Still, the country is exhibiting surprising resilience in the face of the global economic downturn. Growth topped 6 percent last year, and Indonesia was the fastest-growing economy in southeast Asia in the first quarter of this year. "All off a sudden, everybody is contracting except for Indonesia," Castle said. "We've had more visiting regional heads and so on in the last six months than we had in the last six years."